This product does not qualify for Free UK Delivery. Delivery Charges will apply. 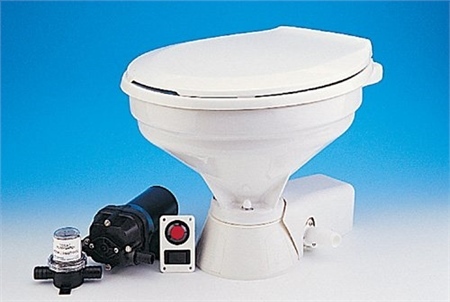 Made to the same high standards and specifications as the manual models, these "quiet-flush" Jabsco marine toilets use a remote mounted diaphragm pump to bring in flushing water with a separate, discharge waste pump. A 3-way switch allows the operation of either the flush or discharge pump or both together so the water level in the bowl can be adjusted. They are reliable, highly functional and offer added levels of comfort and convenience on board. Available in two sizes - Compact or Regular. New, bowl base mounted, low noise waste discharge pump. Separate, remote mounted flush pump. Includes solenoid valve to control flushing pump. Control panel selects normal flush cycle and raises / lowers water level in bowl. May be mounted down to 1m below the waterline. Connections for 13mm (1/2") bore inlet hose, 19mm (3/4") bore discharge hose.